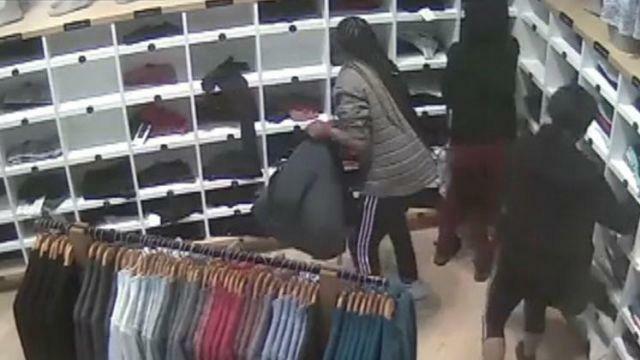 Female thieves targeted several Lululemon stores in the San Francisco Bay area over the last two weeks and have stolen yoga pants worth tens of thousands of dollars. Surveillance video from Berkeley Lululemon store taken on July 18 showed thieves clearing shelves of merchandise in just a matter of seconds. Three suspects were seen entering the store, going straight to the clothes racks and quickly putting the high-end athletic wear on their big bags. The robbery happened very quickly, accomplished in about a minute. White said the suspects went in and out of the store. Then they went into a waiting vehicle outside. The lone store in Berkeley was also struck by the thieves on July 2, 9 and 11, with about two or three people entering between 1 and 4 p.m.
Thieves also hit Lululemon stores in Fresno. Surveillance video released Tuesday showed three women filling their large tote bags with yoga pants. The yoga pants are among the most expensive items in the store, averaging about $100 each. Police said the women thieves took about 148 pairs of yoga pants worth at least $10,000. After the blatant theft, the women simply walked away. Christine Brown, a yoga instructor, happened to be at the store at the time of the theft. She was shocked with how the women quietly just took the said pants and casually left the store. Brown, who had earlier taught a yoga class inside the store, said she was at a loss on what to do or how to react on the glaring crime she witnessed. Interestingly, employees are not allowed to confront or chase shoplifters due to a company policy. The women thieves have also targeted stores in Stanford, Walnut Creek, San Mateo, Stanford and San Jose. The police are already searching for the women responsible for the series of thefts targeting yoga pants. They will use surveillance videos from the stores and in the parking lots to establish the suspects’ faces. It's long past time we started killing niggers on sight. Kill them all. No mercy. Niglets too. Nits make lice. I wonder how much Jim's girdle costs that he wears when he and his gigantic gynecomastia breasts do yoga? Skin Tight covered XXXWL Butts in Electric carts.